The pump assembly, which is mounted on right sid of engine crankcase at the front, is operated by an eccentric on the engine camshaft which actuates the pump rocker arm. The single rocker arm actuates both the fuel and the vacuum sctions of the pump through separate links which permit each section to function independently of the other section. See figure 3-15. The fuel and vacuum sections form two separate, independently operating diaphragm type pumps. They are combined in one assebly for compactness and to permit operation from one eccentric on the engine camshaft. section of the pump. See figure 3-15. Fuel from the gasoline tank first enters the bowl then flows upward through the bowl then flows upward through the screen into the fuel pump. The bowl provides a sttling chamber for water and the dirt which cannot pass the screen. The bowl and screen should be cleaned periodically. b. Operation of Fel Section fo Pump. The function of the fuel section of the pump is to draw gasolin from the tank and supply it to the carburetor in sufficient quantity to meet engine requirements at all speeds and loads. 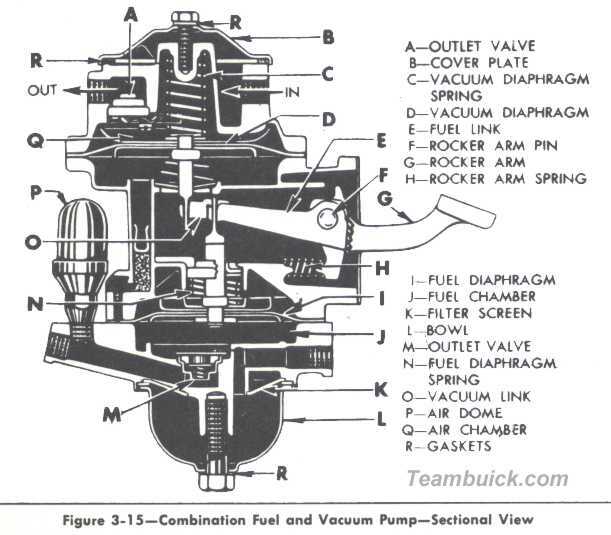 Vacuum created in the fuel chamber by upward movement of diaphrabm holds the oulet valve (M) closed and causes fuel to flow from the gasoline tank, through the inlet valve (not shown), into the fuel chamber. The return stroke (low point of cam) releases the compressed diaphragm spring which then exerts pressure on the diaphrabm and the fuel in the chamber. This pressure closes the inlet valve and forces fuel out through the outlet valve to the carburetor in an amount governed by the pressure in the pump-to-carburetor line. 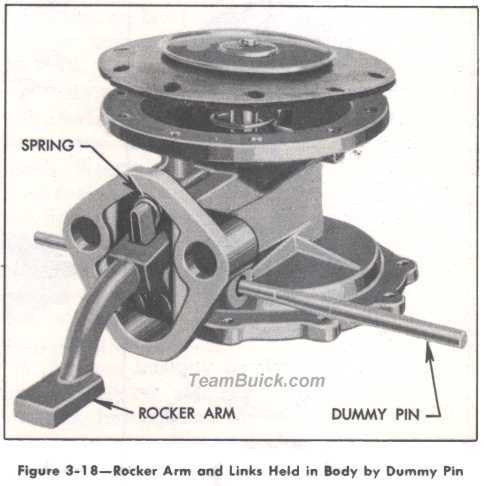 The fuel link is hinged to the rocker arm so that the link and the connected fuel diaphragm can be moved up, but not down, by the rocker arm. The link and the diaphrabm are moved downward only by the diaphrabm spring. The pump, therefore, delivers fuel to the carburetor only when the fuel pressure in the outlet line is less than the pressure maintained by the diaphrabm spring. 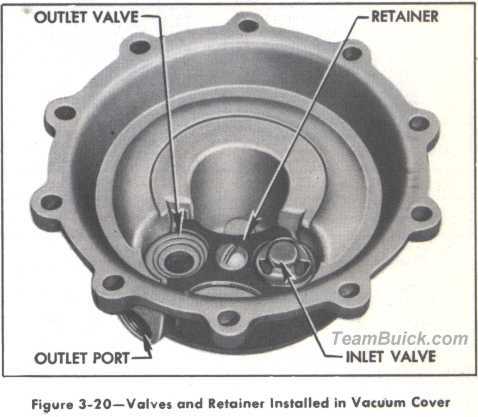 This condition arises when the carburetor float needle valve is not seated and the fuel passage from the pump into the carburetor float chamber is open. When the needle valve is closed and held in place by the pressure of the fuel on the float, the pump builds up pressure of the fuel on the float, the pump builds up pressure in fuel chamber until it overcomes the pressure of the diaphrabm spring. This pressure results in almost complete stoppabe of diaphrabm movement until more fuel is needed. Normal diaphragm stroke is approximately 1/64". The air dome used on the Series 70 pumps provides a pocket in which fuel under pressure can compress a certain volume of air. When the pressure is relieved (pump on suction stroke) the pocket of compressed air pushes the fuel on to its destination. The air dome minimizes flow variations experienced with a two-cycle pump stroke and increases the pump output. Pressure created in the air chamber by upward movement of diaphrabm holds the inlet valve (not shown) closed and expels air through the outlet valve (A) ino the engine manifold. The return stroke (low point of cam) releases the compressed diaphrabm spring which then pushes the diaphrabm down, creating a vacuum in air chamber. This vacuum closes the outlet valve and draws air through the inlet valve from the windshield wiper. The diaphrabm operates only when engine vacuum is insufficient for windshield wiper action. When manifold vacuum is greater than that created by the pump, the stronger manifold vacuum pulls the diaphrabm into the air chamber, holding the vacuum link out of engagement with the rocker arm. The windshield wiper then operates on manifold vacuum without assistance from the pump. When intake manifold vacuum is low, as on acceleration or at high speed, the vacuum created by the pump will assure adequate operation of the wiper. 1. Make certain that there is gasoline in the tank. 2. With the engine running, inspect for leaks at all gasoline feed pipe connections at gasoline tank, fuel pump, gasoline filter, and carburetor. Tighten any loose connections. Inspect the flexible connection in feed line and all pipes for dents or kinks which would restrict the flow of fuel. Air leaks or restrictions on suction side of fuel pump will seriously affect pump output. 3. Inspect for leaks at fuel pump diaphrabm flange. Tighten the cover screws alternately and securely. Do not use shellac or any other adhesive on diaphragm. 4. Clean the filter in fuel pump and gasoline filter at carburetor and make sure that filter bowl gaskets are sealing securely. 5. Disconnect pump-to-carburetor pipe. Ground primary ternminal of distributor with jumper wire so that engine can be cranked without firing. Place suitable container at end of pipe and crank engine a few revolutions. If no gasoline, or only a little, flows from pipe the feed pipes are clodded or fuel pump is inoperative. Before condemning the fuel pump, disconnect feed pipes at pump and blow through them with air hose to make sure that pipes are clear. 6. If gasoline flows in good volume from pipe at carburetor it may be assumed that the fule pump and feed pipes are okay; however, it is advisable to make the following "static pressure" test to make certain that fuel pump is operating within specified pressure limits. 7. Attach a suitable pressure gauge to the disconnected end of gasoline pipe at carburetor. Run engine at 450 and 1000 rpm on gasoline in carburetor bowl and note reading on pressure gauge. 8. If fuel pump is operating properly the pressure will be 4 to 5 pounds and will remain constant at speeds between 450 and 1000 rpm. If pressure is too low or too high, or varies materially at different speeds, the pump shold be removed for repairs. NOTE:If pressure gauge is connected at pump outlet instead of at end of feed pipe the pressure should be 41/2 to 51/2 pounds. To test the vacuum section of pump, fully open the windshield wiper valve and observe the wiper blade while alternately idling and accelerating the engine.Operation of the windshield wiper should conginue at nearly constant speed regardless of the engine speed or throttle opening. NOTE:A dry windshield has the effect of slowing wiper blades in comparison with operation over a wet windshield. Consider this when testing, or wet the windshield by spraying with water. If windshield wiper does not operate properly make the following inspection and test. 1. Check windshield wiper transmission cables to make sure they are correctly attached to wiper motor, are properly located in pulleys on wiper transmissions and cable tensioners, and are not rubbing against anything under the cowl. Make certain that wiper control hoses are properly connected at manifold, wiper motor, and control on instrument panel. 2. Check tightness of vacuum pump cover plate screw and check all pipe and hose connections between pump and windshield wiper motor. Tighten loose connections and replace any cracked or deteriorated hose. 3. If windshield wiper does not operate properly after all pints of leakage have been corrected, detach both pipes at vacuum pump and join them with a piece of rubber hose. Slowly operate engine from idle to about 25 MPH speed: the wiper should run at full speed operating on engine vacuum only. If it does not, it can be assumed that the wiper motor or tubing is defective. The pump vacuum section is inoprative if the windshield wiper operates properly on engine vacuum but not on pump vacuum. 4. A further test of vacuum pump may be made by attaching a vacuum gauge to the inlet port (port connected to wiper motor), with outlet pipe disconnected. CAUTION:Always make this test of vacuum pump with the oulet open. The downward or exhaust stroke of pump is positive and the mechanism may be damaged if the oulet is closed or restricted. 5. With engine operating at equivalent of 20 MPH road speed, the gauge should show 7 to 12 inches of vacuum. Less than 7 inches of vacuum indicates an inoperative vacuum pump. 6. Before removing the fuel and vacuum pump assembley for repairs to vacuum section, it is advisable to remove the cover plate and check condition of cover plate and screw gaskets, and condition of the screen undr the cover plate. Leaking gaskets or a plugged screen would affect vacuum pump operation. If only the vacuum pump requires replacement of the diaphrabmor valves, the procedures given in subparagraphs a, c, and e, should be followed. If the fuel section of pump requires replacement of the diaphragm, however, the complete proceedure given in subparagraphs a through e must be followed. The fuel iaphrabm is sealed around the pull rod with a tight fitting oil seal which is staked into the pump body. Tilting of the diaphragm to unhook pull rod from the fuel link will damage this oil seal. The safest method to follow is to first remove the rocker arm and link so that diaphragm pull rod can be pulled straight out without damage to the seal. 1. Plug all openings and thoroughly wash outside of the unit with cleaning solvent and blow off with air hose to remove all dirt and grease. 2. Mark edges of vacuum cover and pump body with edge of a file, so that cover may be reinstalled in its original postion on body. 3. Remove only two cover screws from opposite sides of the cover, and substitute for them two No. 10-32 x 1 1/2" fillister head screws. Turn the two long screws all the way down, and then remove the balance of the short screws. Alternately back off the two long screws, a few turns at a time, until the force of the heavy vacuum diaphragm spring is no longer effective. If cover and body stick together, rap cover with screwdriver handle after backing off long screws a few turns; do not pry between the flanges. Remove long screws, vacuum cover assembly, diaphragm spring and spring retainer. See figure 3-15 6. Remove oil seal retainers, seal, and spring from diaphragm pull rod. See figure 3-16. 1. Mark edges of fuel cover and pump body with edge of a file, so that cover may be reinstalled in its original position on body. 2. Remove fuel cover screws and separate the cover from pump body by rapping with screwdriver handle; do not pry between flanges. 3. Remove bowl and gasket, screen, valve retainer and valves from fuel cover. See figure 3-16. 4. File rivited end of rocker arm pin flush with steel washer, or cut off end with 3/8" ddrill, then drive out rocker arm pin with a drift punch. Wiggle rocker arm until link unhooks from fuel diaphrabm, then remove rocker arm and link assembly, and rocker arm spring. 5. Remove fuel diaphrabm from body by pulling straight out. CAUTION:Do not tilt excessively or staked-in oil seal in pump body will be damaged. Remove diaphrabm spring and spring retainer. 6. Remove bushing from rocker arm to disassemble rocker arm, two vacuum links, one fuel link, link spacer, and link washers (there may be one or two link washers). See figur 3-16. Each diaphragm kit contains the proper diaphragm, valves, springs, and gaskets to service the indicated section of the pump. 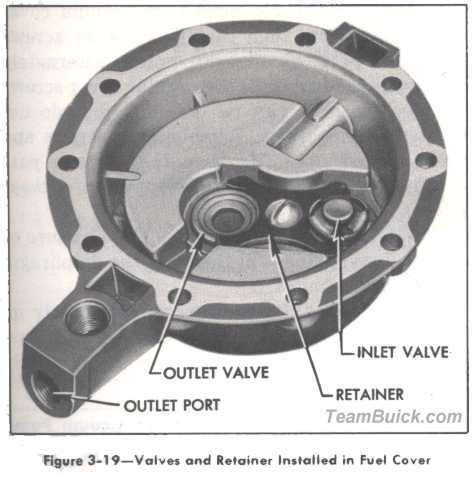 A separate rocker arm pin is required with the guel pump diaphragm kit. The overhaul kit contains all parts in both diaphragm kits plus links and other parts subject to wear or deterioration. 1. Clean and rinse all metal parts in solvent. Blow out all passages with air hose. flanges. Examine all screw holes for stripped or creossed threads. Replacement of the pump assembly is advisable if one of the three main castings is not serviceable. 3. Inspect rocker arm for wear or scores at camshaft pad, at point of contact with links, and at pivot hole. 4. Inspect screws and replace if damaged or obstructed. Screws must fit snugly into recesses around all edges. 5. Replace links if pump has been in service for high milage. Amount of wear cannot be determined visually. 6. Replace diaphragm in faulty section of pump, or both diaphragms if service mileage is high. 7. Replace valve and cage assemblies as these parts cannot be visually checked for wear. 8. 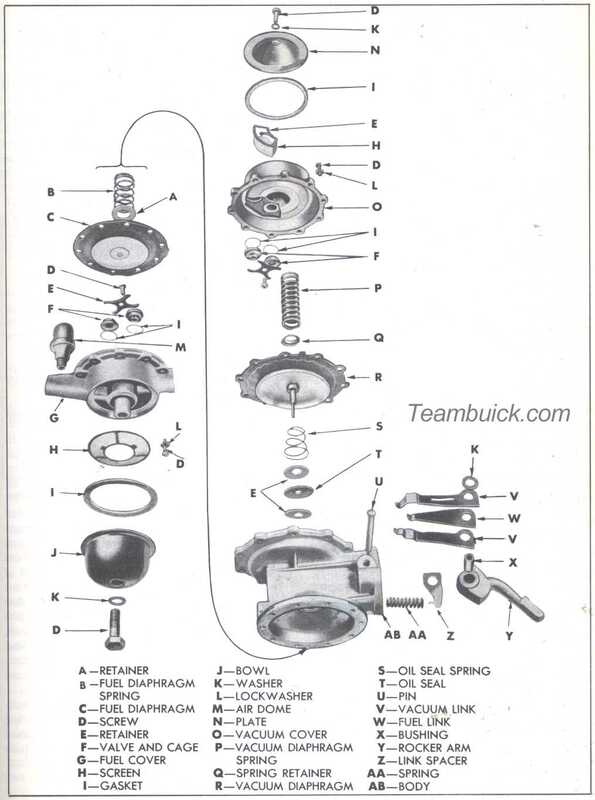 Replace rocker arm and diaphragm springs, as removed, because old springs may be distorted or corroded. 9. Replace rocker arm pin and washer if removed, as these cannot be used again. 10. Always replace all gaskets removed, to insure tigth seals. 1. Soak new fuel diaphragm in clean kerosene while performing the following steps. Fuel oil or gasoline may be used. 3. Line up the holes in links and spacer, slide parts between the jaws of rocker arm with flat surface of rocker arm pad facing in same direction as link hooks, then install the pin bushing. See figure 3-17. 4.Check clearance of links and spacer in rocker arm. If required, place spacer washer between rocker arm and one or both vacuum links to take up clearance while allowing free movements of links in rocker arm. 5. Stand the pump body onthe bench, fuel flange down. Set rocker arm spring in body with one end over cone cast into body. Slide rocker arm and link assembly into body, with open end of all link hooks pointing up toward vacuum flange, and engage rocker arm spring with projection on link spacer. Hold parts in body with the small end of Rocker Arm Dummy Pin KMO-707 (AC No. PT-6. See figure 3-18. 6. Turn the pump body over so the fuel diaphragm flange is up. Set the diaphragm spring on the staked-in oil seal, and the retainer on top of the spring. Push diaphragm pull rod through retainer, spring and oil seal. Flat of pull rod must be at right angles to link. Hook diaphragm pull rod to the short center fuel link. CAUTION Do not tilt diaphragm pull rod excessively as this may damage the oil seal. 7. Push Dummy Pin through body so that large diameter aligns the holes in all parts, then drive the pin out with the new permanent rocker arm pin. 8. 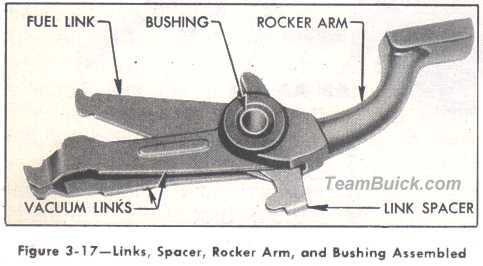 Support head of rocker arm pin on a suitable steel block, place washer over small end of pin so it lies flat against body, then spread or "mushroom" end of pin with a ball peen hammer. another valve in other seat with spider facing up. Place retainer over valves with humped side up and install retainer screw. See figure 3-19. 10. Install gasoline screen, bowl gasket and bowl in the order named, then install bowl screw and gasket and tighten screw securely. 11. A diaphragm gasket (not used in factory assembly) is included in each repair parts kit. Its purpose is to compensate for slight warpage of the fuel cover flange that may occur in service. Place this gasket on the fuel diaphragm and align all screw holes in gasket, diaphragm, and pump body. NOTE:Holes may be kept in alignment and possible distortion of diaphragm may be avoided by making two guide pins with short 10-32 threads and temporarily installing these in opposite screw holes in body flange. 12. Place fuel cover in position so that file marks on cover and pump body are in line, maintain pressure on rocker arm so that diaphagm is flat across body flange, then install all cover screws and lockwashers until screws just engage lockwashers. Be sure that screws pass through holes in fabric of diaphragm without chewing. 13. Pump rocker arm two or three full strokes to make sure that diaphragm is not stretched too tight, then hold arm to fully compress the diaphragm spring while tightening cover screws. Tighten screws alternately on diametrically opposite sides until all are tight before releasing the rocker arm. CAUTION:Diaphragm must be held in flexed position until all screws are tightened, otherwise diphragm may be stretched too tight and cause pump to deliver excesive pressure. 1. Soak new vacuum diaphragm in clean kerosene while performing the following steps. Fuel oil or gasoline may be used. 2. Place one gasket in each valve seat in vacuum cover. Place one valve in seat adjacent to outlet port with the three legged spider down. Place another valve in other seat with spider facing up. Place retainer over valves with humped side up and install retainer screw. See fiure 3-30. 3. Turn cover over, and set screen in recess over valve hole. Set screen retainer on screen. Place cover plate gasket, cover plate, screw gasket, and cover plate screw in position in the order named. Tighten cover screw. 4. Install oil seal parts on vacuum diaphragm pull rod in the following order: sprin, retainer, oil seal, and retaainer. Turn outer retainer to lock parts on pull rod. 5. Hold pump with fuel side up so that vacuum links will drop into position for attaching vacuum diaphragm pull rod. Insert diaphragm pull rod through opening in pump body and hook it to the two long vacuum links. 6. Hld vacuum diaphragm in place while clamping pump body mounting flange in a vice, with diaphragm up. 7. Depress rocker arm and insert hooked end of Diaphragm Flexing Tool KMO-613 (AC No. PT-8) between rocker arm andthe stop cast in pump body, then release rocker arm. 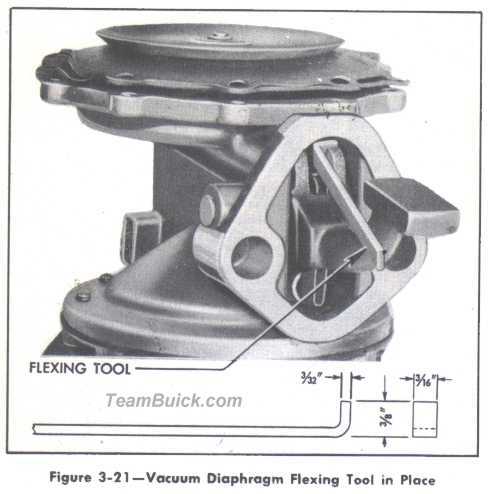 The vacuum diaphragm will be held in a flat or level position. Se figure 3-21. 8. Place spring retainer over the riveted end of diphragm pull rod, place diaphragm spring on the retainer, then place vacuum cover over the spring. Make sure that retainer stays down in place against the diphragm protector. 9. Line up the file marks vacuum cover and pump body, then install two long screws (10-32x 1 1/2") in opposite holes. Alternately turn screws down until the regular cover screws and lockwashers can be installed, but do not tighten these screws. Remove long screws and install short ones. Be sure that screws pass through holes in fabric of diaphragm without chewing. 10. Remove the flexing tool. The pressure of the vacuum spring will then flex the diaphragm the correct amount. 11. Tighten all cover screws alternately on diametrically opposite sides, turning each several turns at a time, until all are securely tightened. Bench tests of the fuel and vacuum sections of teh pump require equipment which is not availavle in service stations; therefore, tests must be made after installation of pump assemly on an engine. Test fuel section of pump as described in paragraph 3-15. Test vacuum section of pump as described in paragraph 3-16.